A condominium is not a specific kind of home, but rather a specific kind of ownership. Instead of owning a piece of land outright, as with freehold ownership, condo owners own a space, called a unit, in the condo structure. Each unit is defined by the Condominium Declaration that describes the condo development. The main difference is that condo owners must pay monthly common fees, which cover the cost of insuring and maintaining the condo development. Most condo financing programs will require the condo to be less than four floors and that the loan be less than the conforming limit, currently $322,700. If you are considering an FHA loan for your condominium, it will need to be on the FHA approved condominium list. However, if the condominium does not meet these standard criteria, there are several programs which will help. Programs are also available for high rise condos and for condominiums whose owner occupancy ratios are below 50%. 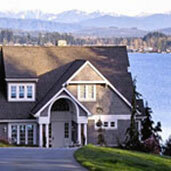 Rates are generally 1/4% above the current market but you can almost always get your loan done. Run the numbers on our web site to get an idea about condo financing rates, payments and closing costs. Use our network of lenders and expert mortgage specialists to find the best loan for your condo.